Home / Breaking News / Posting does not happen even after three months of becoming a PSI! Posting does not happen even after three months of becoming a PSI! Posting does not happen even after three months of becoming a PSI! 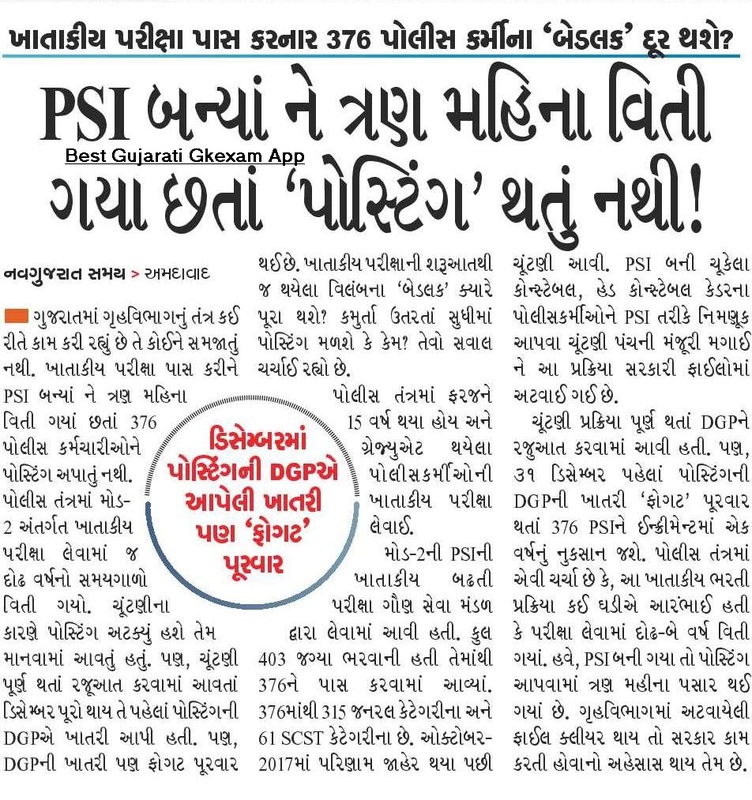 Nobody knows how the home-grown system works in Gujarat. After passing the departmental examination, after becoming a PSI, three months have passed, 376 police personnel are not given posting. In the police system, only one and a half years have passed since the Department-II under departmental examination. Posting was believed to be postponed due to the election. However, before the completion of the election, the posting DGP assured before the completion of the election. Also, the DGP's confirmation has also been proved. When will the 'badalak' delay the beginning of the departmental examination? Whether the posters will be posting till the end? The question is being discussed. After 15 years of service in the police system and graduated police personnel have taken departmental examination. . The Department-level promotional examination of the PS-2 was taken by the Secondary Service Board. Of the total 403 space to be filled, 376 were passed. 376 out of 315 general category and 61 SCST category. Elections came after the results were announced in October-017. The constable, who constituted a PSI, appointed the constable cadre police personnel as a PSI and got the approval of the Election Commission and the process has been stuck in government files. DGP was released after the completion of the election process. Also, before December 31, the DGP's confirmation of 'posting' will result in loss of one year loss of 376 PSI incurred. It is discussed in the police system that at the time of the departmental recruitment process it was initially that the examination took one to two and a half years. Now, if PSI becomes a posting has passed three months of posting. If the files stuck in the home department are cleansed, then the government seems to be working.